New 'Pop in Shop' an Immediate Success! 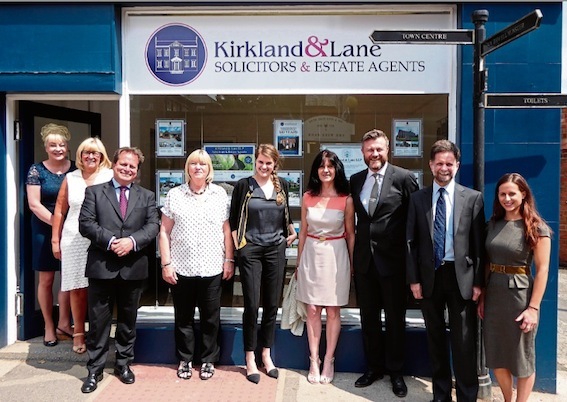 LAST month Kirkland & Lane were pleased to announce the 'expansion of their services' with the opening of a new "Pop In Shop" at 7 Church Street, Southwell adjacent to Catherine's ladies clothes shop. "We have only been open a short time, but already the new shop has been busy and extremely well received," commented senior partner, Charles Beaumont. "We have had very positive feedback from a variety of visitors. I have received this feedback first hand as I am at the shop myself every Wednes- day. The common thread from clients has been how much more convenient it is for them to pop in during the course of their daily lives and for a number of clients, how much easier access to the new shops." Charles was also delighted by the number of new clients the shop is attracting, saying: "In addition to the praise from existing clients we are seeing an increased number of enquiries from people who have not used the firm previously. They too are dropping in for an informal chat to get advice and/or to book an appointment at our main offices at North Muskham Prebend." "We understand that with life today 'time' is ever more precious. People popping in to the new shop have been saying that they have been meaning to find time for ages to dis- cuss things like drafting a will or looking into the preparation of a Power of Attorney. We know these are things, which people sometimes put off or won't necessarily go out of their way to pursue. Such people have simply popped their head round the door to get some advice and start the process running. A large number of people have also just nipped in to ask for a set of property particulars from our property side or to register themselves as prospective buyers too." "In expanding our services our primary desire was to enhance our cur- rent offering. We wanted to enhance it in such a way as to encourage more people to engage with us, formally or informally, we sought to make our- selves more readily available, more accessible and approachable to as wide a range of clients as possible. Given this we are so pleased at the unequivocal positive feedback from clients and even just passers-by." Charles concluded: "We look forward to welcoming many more clients both old and new to Kirkland & Lane Solicitors & Estate Agents at our new shop and obviously at our main offices at North Muskham Prebend."